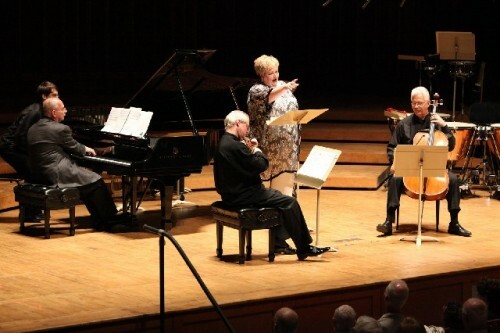 Stephanie Blythe with Alan Smith, piano, Andrew Jennings, violin, and Norman Fischer, cello. Hillary Scott photos courtesy of the BSO. Blythe embraces her friend Norman Fischer. Accompanied by the Tanglewood Festival Chorus. Luigi Dallapiccola, Canti di Prigiona (1941) John Oliver and the Tanglewood Festival Chorus and members of the BSO and TMC Fellows and TMC Guests. Traditional “Shenandoah” for mezzo-soprano and chorus arranged by Marshall Bertholomew and James Erb, Stephanie Blythe, John Oliver conducting the Tanglewood Festival Chorus. 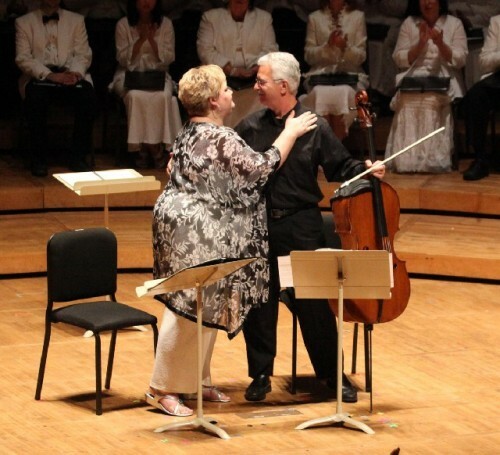 During the second part of her program at Ozawa Hall last night, Stephanie Blythe, the renowned mezzo-soprano was seated with the cellist Norman Fischer of the Boston Symphony Orchestra. He is one of her Friends as the title of the program indicated. She spoke briefly and warmly with the audience, informing us of her very special relationship to Tanglewood over the last several years. After receiving her Bachelor's degree in Music (Crane School of Music in Potsdam, NY) in 1993, she earned a 2-year Tanglewood summer fellowship. And she has returned ever since. For her 40th birthday, she received a gift from the composer and pianist Alan Smith in the form of a new arrangement of “There Is a Balm in Gilead” which she then performed with Fischer. Smith figured prominently in the program as composer and pianist. While Blythe is known for her performances with the Metropolitan Opera, this was an intimate evening with an emphasis on Americana. The notable departure from this theme had John Oliver conducting the Tanglewood Festival Chorus in Luigi Dallapiccola’s, Canti di Prigiona (1941). It comprised three segments “Prayer of Mary Stuart” “Invocation of Boethius” and “Farewell of Girolamo Savonarola.” There was interesting instrumentation including two harps, two pianos, two vibraphones and four percussionists. The music was soft, almost whispering with discreet and subtle percussive accents. With Blythe absent from the stage it made an interesting interlude in the program as well as a tribute from the singer of her work with Oliver. Written during World War Two Dallapiccola's composition with solemn intensity relates to the vigils of condemned prisoners. Mary Stuart beheaded on the orders of her counsin Elizabeth 1. The philosopher Boethius was an early martyr of the Church. Savonarola was a firebrand preacher from Florence who called for reform of the corrupt church. This precursor of Martin Luther with a handful of followers was burned at the stake. The evening opened with Smith’s Vignettes Covered Wagon Woman from the daily journal of Margaret Ann Alsip Frink, 1850. For mezzo-soprano, violin, cello and piano (2007). It was a compelling narrative in 13 brief segments that described the hardships of a pioneering woman who with a group of covered wagons made her way across the American West finally reaching California and the Pacific Ocean. She, like so many others, made the arduous journey just a year after the discovery of gold in California. Blythe is a particularly clear, articulate and precise singer with a powerful voice. It was a great pleasure to follow the compelling story with restrained accompaniment of piano, cello and violin. The highlight of the evening occurred with the opening of the second half of the program. Blythe took a place in the center of the Tanglewood Festival Chorus for another Smith composition, An Unknown Sphere, based on the poetry of Walt Whitman. The singing of Blythe had the power to sustain over and blend with the magnificent choral arrangement. It was a collage of excerpts from Leaves of Grass, including “So Long” from Songs of Parting, “Grand is the Seen” from Second Annex: Good Bye My Fancy, and “A Clear Midnight” from From Noon to Starry Night. Following the text published in the program notes provided unique access to the intense spirituality and questioning of the sublime intent in the poetry of Whitman. It took the measure of the individual soul set against the infinity of nature and the universe. During a time of political and social chaos and deep division, this was a timely evening that evoked the greatness and endurance of an American spirit. It was a deeply moving and enriching experience. "Such an interesting review of a fascinating evening. Pointing out thqt Blythe chose to sing songs from American vernacular, as Thomas Hampson does, and not Broadway musicals is important as classical artists try to draw in an audience. Thanks Charles for celebrating our great American mezzo. Brava and bravo to you."